The Structure House Weight Loss Plan was created by Gerard Musante, who is the founder and director of the 30-year-old Structure House Center for Weight Control in Durham, N.C.
Musante says that the key to losing weight lies in understanding your relationship with food. His book is a guide that will help dieters to understand the principles that are the foundation of the approach he offers at the Structure House Weight Loss Center. One aspect of the Structure House Diet involves helping you to understand how you have used food in the past in ways that go beyond its nutritional value. Musante says the problem isn’t with food as such but rather with an imbalance in your relationship with food. Dieters are encouraged to closely evaluate eating habits and behaviors, to identify food triggers and develop new methods of coping with challenges. This program does not require that you follow a strict diet with the idea being that when you gain control of your eating habits you will be able to make better choices more easily. There are no forbidden foods but you are advised to keep track of your calorie intake and portion sizes. Dieters are also recommended to stick with three meals a day, avoid snacking and emphasize foods that are high in fiber, high volume, contain a high level of nutrients, and a low amount of calories. The Structure House Diet includes a seven-day meal plan. An exercise plan is not built into this program but dieters are encouraged to engage in regular exercise. The Structure House Diet includes tips on how to get started with exercise as well as how to design an exercise plan that will fit in with your lifestyle. 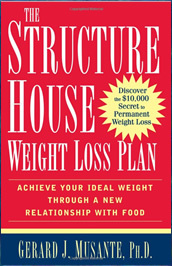 The Structure House Weight Loss Plan: Achieve Your Ideal Weight Through a New Relationship with Food retails at $14. Program designed by an experienced weight loss expert. Educates dieters on what to eat for adequate nutrition. Includes a 7-day meal plan and recipes. Addresses the psychological factors necessary for successful weight loss. Alternative for those who are unable to visit the Structure House Weight Loss Center. Involves additional time to be spent on meal planning and preparation. Discourages snacking, even on healthy foods, which can help some dieters to reduce appetite. May not be as effective as visiting the Structure House Weight Loss Center. This book offers dieters the opportunity to benefit from Musante’s successful approach to weight loss without the need to actually visit the Structure House Weight Loss Center. The program will appeal to dieters who prefer a structured approach to dieting but also don’t want to follow a very restrictive diet. The Structure House Diet is designed as a lifestyle approach to weight management with a focus on changing your relationship with food and eating for nutrition.